The Depstech 1200P Semi-rigid Wireless Borescope Camera is a new and improved version of one of the most popular products we’ve ever covered. In a nutshell, it’s a borescope camera that connects to your iPhone or Android phone wirelessly. Your phone becomes the viewfinder as you snake the camera into any space you want, allowing your phone to see where no normal smartphone can. You can also save the videos to view later. This cool camera comes with a hook and a magnet accessory as well, so you can lose it to retrieve jewelry or keys in seconds. It’s an awesome gadget and it’s on sale right now on Amazon. There’s a lightning deal going from 5PM until 11PM tonight, or while supplies last. You’ll save 20% during the deal, so hurry up and check it out. 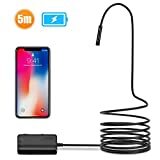 Innovative WiFi Endoscope with great compatibility: different from endoscope camera in the market, this wireless wifi inspection camera will work with Android devices( Android 2.3+), as well as iPhone IOS system(iOS 6.0+). This makes the endoscope appeal to many users with various kinds of devices. True 1200P Resolution Camera: reaching 1600×1200, this endoscope is able to capture HD snapshot of the unknown, mysterious places where the human eyes are difficult to catch the image, along with recording a vivid live- video in AVI format, available to be stored on your devices upon enabling the app to accessible to the Photo App. Simple Operation Method – Turning on WiFi box to generate endoscope WiFi, connect your working device with the endoscope WiFi, and then just enjoy the expected view with our unique app “Depstech”. Featuring 16.5FT cable, waterproof and 8.5mm diameter camera, 6 adjustable LED light on the camera, applicable for kinds of scenarios , regardless of dark area, damp or wet area etc. The semi-rigid cable can bend and hold it’s shape to access confined place, such as curved holes or pipes. Furthermore, it has a durable lithium battery, capacity up to 1800mAh which support 3-4h working time without LED light on, outshining other endoscopes with working time less than 1h.